Is Surfing In Westport Wa Family Friendly? Westport has always embraced surf families from all over the state of Washington. This is what makes Westport special in our minds – you always seem welcome, it’s like going back home to visit the parents, cousins and friends you haven’t seen for years, you know it’s only yours to visit – but you feel like you can stop by any time and feel totally welcome. Surfing is now an important part of the DNA that makes this sleepy coastal town so special – come surf and enjoy all that is Westport and bring the family, they belong here. Yes, by all means bring the kids, the dog and the neighbors kids. Just make sure you’re prepared for a lot of sand in everything. Thankfully, the new showers have two shower head levels, one high and one low. One level is perfect for an adult – hitting you at head high, the second level is at a perfect height for a 5 year old or dog. Sometimes it looks like a water park with all the kids running around getting more wet and sandy – good thinking WA State Parks, its a hit. Much of the original Westport Surfing community came from the Northern California City of Santa Cruz – which is steeped in surfing history and tradition. 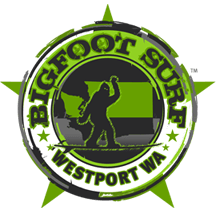 In our opinion, we (BigFoot) owe the Westport surf family pioneers a special thanks for bringing surfing to WA State in a manner that has influenced positive growth for the surfing community as well as attracting surf tourism to the Westport business community. If you have questions about surf lessons for youth give us a shout – we are trained and certified in adult, child education and sports bio-mechanics. We currently offer private lessons to children and youth from age 7 through 13. We would be happy to offer suggestions to parents who would like to get their children younger than 7 surfing – unfortunately, we are restricted by our insurance terms and cannot offer surf lessons to the 7 and under age group. The Facilities At Westhaven State Park – Two Words, They’re Great! Westhaven State Park has been newly renovated and the facilities themselves are built perfectly for surfers, day trippers, fishermen and razor clam diggers. With bathrooms and a separate shower area it offers a great way to get the saltwater and sand rinsed off yourself and all your surf gear, your child and your dog. Parking – hmmm. If it looks like a good weather weekend, holiday, or if there is a surf competition – expect parking to be challenging, as it is with all popular parks in Washington. Westhaven does have plenty of parking and you will never not be able to park – the question then is how far do you want to walk with all your gear. In planning for your surf adventure try to get into Westport early – the surf shops are generally open at 9:00AM and close at 5:00PM. All rentals are due back by 4:30PM at our last check – call the surf shops to confirm. Surfboard – we recommend a 9’0 or 9’6 longboard surfboard, 8′ at the minimum, in the case of the beginner surfer bigger-is-better. Wetsuit – a 5/4ml wetsuit (you will stay warm) is the best choice for surfing at Westport, with an average water temperature of 47 to 53 degrees Farenheit – at the least a 4/3ml wetsuit to stay comfortable. Water – bring plenty of it, even though you’re in water – it’s salt water and as in any sport it’s vital, especially in surfing to stay hydrated. Food – you’re going to be hungry after burning all those calories. Make sure you bring easily digestible high protein food stuffs. We love peanut butter and jelly sandwiches and beef jerky – but our favorite snack is a Snickers Bar (hint). Sunscreen – this is a high-priority common sense surfer item – make sure you get the water proof kind of course. Sunburns from spending a day in the water can be serious business. Clothing – the weather is always sunny in Westport… Hmmm – bring appropriate all seasons gear even in the summer. Extras: sweatshirt, rain gear, beach towel, bathing suit, rash guard, appropriate footwear etc. Beach Camp Gear – bring a beach chair, cooler or backpack for your surf camp. A beach camp is essential for your day – you don’t want to be traveling up to your car all day long. Suggestion: Button & zip everything up – especially your food, the local crows are excellent at getting into your favorite snack. Frisbee – no explanation needed, it’s a surfing tradition. Camera – you won’t want to miss shooting a few photos on your surfing lessons adventure with us. First, we don’t want to get too dramatic, you’re not getting ready to summit Mt. Rainer after all. Rather, you’ll be participating in something we think is a lot more fun but is also going to physically and mentally challenge you! That being said – we would highly recommend preparing yourself for your surfing adventure/surf lesson by being well rested, stretched out, well fed and extremely well hydrated. Surfing is a full fitness sport, you are going to get a full body workout – both physically and mentally. Chances are your going to be surfing all day after the lesson, so be prepared by using your own experience and your personal routine sport fitness preparations. Make sure that you’re mentally prepared to have one of the most fun experiences this side of eating a bowl of home-made strawberry ice cream! We look forward to seeing you on the beach. Surfing has rules that are guidelines to make the sport more safe and enjoyable for all. Here are good ways to go about surfing; written by highly respected professional surfers. Remember and apply these ethics every time you go surfing! You and others will be stoked that you did. Right of Way: Furthest inside, closest to the peak. Do Not: Drop in or Snake. Paddling Out: Paddle Wide. Caught inside stay in the white water. Always: Surf with Your Ability. No big waves until ready. Take off with commitment. Paddle hard. Danger: Do not let go of your board, it’s a danger to others.